Tuesday, October 16, 1838.Springfield, IL. Stuart & Lincoln have easy day in court. They dismiss Hill v. Truett & Truett at plaintiff's cost and file certificate of publication in Ellis v. Nave. Defendant files plea in Poor v. Stafford, and Thompson v. Osborn and A. G. Williams v. Cabiness & Cabiness. They represent plaintiff in all cases.Record. Lincoln writes and signs "Stuart & Lincoln" to joinder in plea in Judy v. Manary & Cassity.Herndon-Weik Collection, Library of Congress, Washington, DC. Friday, October 16, 1840.Clinton, IL? The judge continues Ex parte Fruit and Walker, a petition to sell real estate case in which Lincoln is guardian ad litem of the infant heirs of John McGee. Record. Monday, October 16, 1843.Charleston, IL. Coles County Circuit Court begins fall term. Bagley v. Vanmeter, slander, is tried before jury by Lincoln and Linder. Jury awards plaintiff $80 damages. By agreement, Lincoln is to have $30 of judgment as fee, Linder $20. Herndon-Weik Collection, Library of Congress, Washington, DC. [Mrs. Lincoln's hired girl buys pair of shoes for $1 at Robert Irwin's store.Irwin Ledger. Wednesday, October 16, 1844.Peoria, IL. Thursday, October 16, 1845.Danville, IL. Saturday, October 16, 1847.Charleston, IL. Ficklin and Constable appear before Wilson and Treat in behalf of petitioners, with Linder and Lincoln representing Matson. Court orders slaves discharged from sheriff's custody and from "all servitude whatever from henceforth and forever." At night, Matson, disgruntled at verdict, leaves state without paying his attorneys their fee. Beveridge, Abraham Lincoln, 1:392-97; Record; Charleston (Ill.) Globe, 27 October 1847; Illinois Law Review, I, 366. Lincoln, for complainant, writes and signs declaration, pleas, and instructions for jury in Watson v. Gill. Jury finds defendant guilty and awards Lincoln's client $215. Herndon-Weik Collection, Library of Congress, Washington, DC. Monday, October 16, 1848.Springfield, IL. Lincoln pays 75¢ for umbrella.Irwin Ledger and Journal. Wednesday, October 16, 1850.Urbana, IL. Saturday, October 16, 1852.Urbana, IL. Lincoln writes and files cross bill for defendants in Rhoades, conservator of Moss v. Corray, and writes court order. Photocopy. Monday, October 16, 1854.Peoria, IL. Lincoln and Douglas meet again. Douglas commences to speak at two o'clock and does not finish until after five. Lincoln takes stand and proposes that meeting adjourn until seven, since his will be extended address. At seven people reassemble, and for three hours Lincoln speaks, substantially as he had at Springfield. Illinois Journal, 21 October 1854; Peoria Press, 18 October 1854; Speech at Peoria, Illinois, 16 October 1854, CW, 2:247-83. Tuesday, October 16, 1855.Clinton, IL. Emery v. Illinois Central RR, in which Moore and Lincoln represent defendant, is continued. In Dungey v. Spencer, defendant, represented by McKinley and Weldon, files demurrer which is sustained as to two counts and overruled as to third. On Lincoln's motion defendant is ruled to plead by two o'clock. Record. Friday, October 16, 1857.Clinton, IL. Lincoln writes and files affidavit in Phares v. Dockum, and another in Smith, Murphy & Co. v. Woodard & Beam. He writes bill for discovery in Snell v. Kelly. Photocopy; Herndon-Weik Collection, Library of Congress, Washington, DC. Springfield, IL and Lincoln, IL. Saturday, October 16, 1858.Springfield, IL and Lincoln, IL. Lincoln travels by train to Lincoln, Illinois. A newspaper reports that the train's cars "were completely filled inside, and covered with passengers on top, before reaching Lincoln." Lincoln arrives at about noon and "partak[es] of some refreshments." At approximately two o'clock, after local attorney Samuel C. Parks introduces him, Lincoln begins a two-hour speech. He delivers the remarks from "the stand, erected near the west front of the Court House" before approximately 5,000 people. 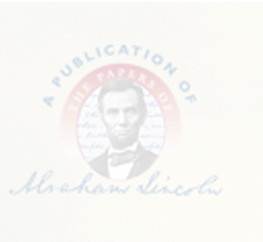 A newspaper reports, "Mr. Lincoln made an eloquent speech, and showed up [Stephen A.] Douglas' inconsistencies in fine style." Daily Pantagraph (Bloomington, IL), 18 October 1858, 2:2; Daily Illinois State Journal (Springfield), 18 October 1858, 2:3; Chicago Daily Press and Tribune (IL), 21 October 1858, 2:3. Someone, perhaps Lincoln, purchases nine pounds of sugar and five pounds of "Java" coffee from the John Williams & Co. store and charges the total cost of two dollars to Lincoln's account. Harry E. Pratt, The Personal Finances of Abraham Lincoln (Springfield, IL: Abraham Lincoln Association, 1943), 145-49. Tuesday, October 16, 1860.Springfield, IL. John G. Nicolay records incident: "Mr. Lincoln, coming to his room this morning, was accosted by a stranger who inquired the way to the same place. Mr. Lincoln offered to show him the way, and arriving, very much electrified the man by turning round and saying to him, 'I am Lincoln.' He had no idea he was being ciceroned by the famous Rail Splitter." ISLA—Memo. Ms.
Wednesday, October 16, 1861.Washington, DC. President and Secretary of State William H. Seward call on General George B. McClellan for informal conversation. McClellan, War for Union, 170. President and Secretary of State Seward also visited the Navy Yard. National Republican (Washington, DC), 17 October 1861, 3:2; Evening Star (Washington, DC), 17 October 1861, 2:2. With Generals Sprague and Anderson, Lincoln reviews the Fourth Rhode Island regiment. National Republican (Washington, DC), 17 October 1861, 3:2. Thursday, October 16, 1862.Washington, DC. Gen. Prentiss and group of officers captured at Shiloh visit President. Nicolay to Bates, 16 October 1862, John G. Nicolay Papers, Library of Congress, Washington, DC. Lincoln interviews D. R. Goodloe, chairman, Commission for Emancipation of Slaves in District of Columbia, and William H. Channing, pastor of Washington Unitarian Church, 6th and D Sts. NW., regarding Channing's appointment as chaplain. Memorandum: Appointment of William H. Channing, 16 October 1862, CW, 5:464-65. Friday, October 16, 1863.Washington, DC. Mrs. Elizabeth J. Platt of New Jersey calls and asks for son's discharge. [Lincoln orders it five days later.] Abraham Lincoln to Edwin M. Stanton, 16 October 1863, CW, 6:520. At cabinet meeting President reads his answer to petition from Missouri and Kansas delegation. Bates, Diary. Also reads to cabinet confidential dispatch to Gen. Meade urging him to fight Gen. R. E. Lee. Welles, Diary. Writes Gen. Halleck: "If Gen. Meade can now attack him [Lee] on a field no worse than equal for us, and will do so with all the skill and courage, which he, his officers and men possess, the honor will be his if he succeeds, and the blame may be mine if he fails." Abraham Lincoln to Henry W. Halleck, 16 October 1863, CW, 6:518-19. On behalf of Mrs. Elizabeth E. Hutter, of Philadelphia, Pennsylvania, Lincoln writes a letter of introduction to Quartermaster General Montgomery C. Meigs. Lincoln explains, "Please see Mrs. Hutter, who has given most of her time to the soldiers, during the war, and who wishes to present an invention of hers for the soldier's comfort, which she would like to have introduced into the service . . . I certainly would prefer having it over my ears in cold weather, to their being naked." Abraham Lincoln to Montgomery C. Meigs, 16 October 1863, CW, 6:519. Writes T. W. Sweney: "Tad is teasing me to have you forward his pistol to him." Abraham Lincoln to Thomas W. Sweney, 16 October 1863, CW, 6:520-21. Receives from Capt. Diller a further report on gunpowder. Abraham Lincoln to Gideon Welles, 16 October 1863, CW, 6:521. Sunday, October 16, 1864.Washington, DC. President replies to request of Cong. Moorhead (Pa.) for stay of execution: "I do not rem[em]ber about the Peter Gilner case, and must look it up before I can answer." Abraham Lincoln to James K. Moorhead, 16 October 1864, CW, 8:49.